Purchases have to be made with a signature, which is also necessary to earn a regular 1% cash back. Purchases with using PIN and cash withdrawals are not counted as a qualified purchase for this offer. I exclusively use PayPal Business Debit MasterCard for reloading American Express Serve and Chime prepaid card. For AmEx Serve, the limit is $1000 per month. I have already loaded Serve this month. So, I will be able to load $1000 each in Oct and Nov, totaling $2000. For Chime prepaid card, I can load $100 per day until Oct 8th and $200 after Oct 8th. However, after Oct 8th, Chime will start charging a fee for loading the card with some debit cards. PayPal Business Debit MasterCard is probably one of the debit cards that Chime will charge a fee. If so, I’m not going to use PayPal debit card for loading Chime card. I have already loaded today. So, I can load Chime card with PayPal debit card for 15 times (days), totaling $1500. By the date the offer ends, the total of purchases made with my regular spending would be $3500. It qualifies for $30 credit! Should I do extra work for $50 credit? You can take either one of $30 or $50 credit, not both of them. And they are both 1% cash back. There is no bonus even if you spend more ($5000). So, it is not necessary to do extra spend to get $50 credit. However, I will have spent $3500 until the offer ends for sure, and it is only $1500 short for $50 credit. 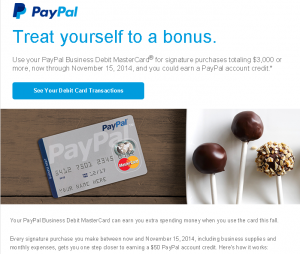 So I will probably use PayPal debit card somewhere else to get $50 credit. I should be careful with using the card as Credit, not Debit when I use at stores.